Is that a Donatello in the MFA’s storage? A scholar says this piece at the MFA is a work of Renaissance artist Donatello. 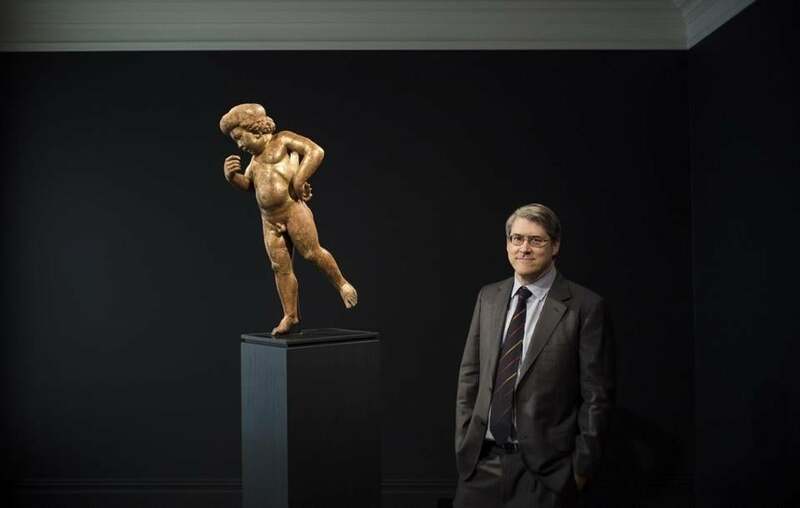 When New York art dealer Andrew Butterfield arrived at the Museum of Fine Arts in the spring of 2013, he carried with him a tantalizing conjecture: An obscure 15th-century sculpture, which the museum had kept in storage for most of the past 30 years, was in fact the lost work of a Renaissance master. Butterfield had not come to Boston out of mere curiosity. A year earlier, he had purchased a veritable twin of the MFA work — a gilded wood carving, known as a putto, of a cherub-like boy perched gamely forward on one foot. Both works were unattributed, and Butterfield, who is also a well-regarded Renaissance scholar, thought that by comparing them side-by-side, he might bolster a case that the 2½-foot-tall pieces had been carved by none other than Donatello, a seminal figure of the early Italian Renaissance and one of the fathers of modern sculpture. “The details correspond, the pose corresponds, the sense of movement and volume correspond,” said Butterfield, listing signature characteristics of the artist. The stakes could not have been higher. Old master works are rare on the open market, and a discovered statue by Donatello — widely regarded as the first sculptor since antiquity to create figures that convey a sense of sinuous, dramatic motion — would undoubtedly fetch millions. His works are even more rare in US museums, which scholars say house only one work generally accepted as by the artist: a marble relief at the MFA. In Munich in 1946, a cherub-like sculpture holds its left arm akimbo with the back of the hand on the waist. Is it a work of Donatello? Having now compared the two putti, Butterfield now says he is “100 percent” certain they are by Donatello. He recently sold his to collector Jon Landau, Bruce Springsteen’s longtime manager and producer, who has an important collection of Renaissance art. As a master 15th-century sculptor from Florence, Donato di Niccolò di Betto Bardi, known universally as Donatello, helped usher in an era of more naturalistic forms. His works, often commissioned for prominent buildings and monuments, are rarely seen outside Italy. Butterfield, a scholar and dealer of Renaissance art, has made a career out of rediscovering lost masterpieces. 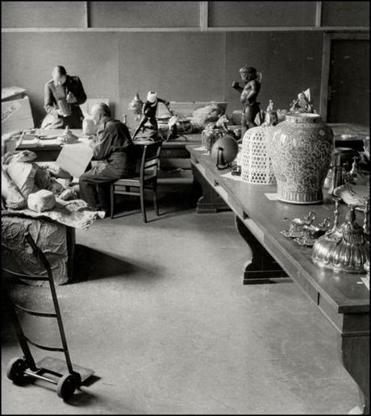 His finds — many ending up in museums — often shed new light on an artist’s work. These discoveries can also be quite valuable. In 2005, for instance, Butterfield identified a life-sized Christ sculpture as the work of Bernini. Misattributed for more than a century, the Baroque sculpture once failed to sell at auction for $200. After sifting through Bernini’s own records, however, Butterfield authenticated the sculpture, which has since been valued at $50 million and now stands in the Art Gallery of Ontario. Significantly, MFA director Matthew Teitelbaum led the Toronto museum when it acquired the Bernini. Still, an artwork can be as difficult to authenticate as the work of a master, in part because there is often no record of its creation and little information about its provenance, or ownership history, before the 20th century. The MFA’s sculpture, simply titled “Cupid,” had a remarkable past, which included being forcibly conveyed to Hitler. Allied forces rescued it in 1945, and the MFA purchased it in 1960 for the equivalent of around $30,000 today. Through it all, the name Donatello has hovered. Early owners believed it to be the work of the master. Others pushed back, arguing that it was from Donatello’s workshop, or a follower. What makes Butterfield so sure the MFA got it wrong, then and now? He came to his conclusion gradually after purchasing his sculpture from an Italian dealer in 2012. Renaissance scholar Andrew Butterfield with a wooden, gilded cherub that he and several other experts believe is a lost work by Donatello. Previous owners had applied layers of varnish. The carving was also posed incorrectly on two feet, a stolid posture that stymied the figure’s natural sense of movement. Then a restorer pointed out that the sculpture should stand forward on its right foot, the left sweeping up from behind, as if dancing or about to take flight. Butterfield shared his hunch with Francesco Caglioti, a Donatello expert at the University of Naples Federico II who accompanied him to the MFA. Together, they studied the twin curves of the cherubs’ backs, the dimpling of their mouths, remnants of their wings, and the curious rounded caps that cinch tight above their curls. Most importantly, they inspected the left arm, which the figures hold akimbo, the back of the hand resting jauntily on the waist. Caglioti and Butterfield argue that the twin cherubs were likely part of a decorative Renaissance interior featuring a ring of wall-mounted putti. Butterfield’s labors culminated last fall with a New York exhibition, a sort of coming-out party where he publicly made his case. The dealer also released a handsomely bound catalog to mark the occasion with supporting essays by several scholars, including Caglioti and Eike Schmidt, director of the renowned Uffizi Gallery in Florence. Faced with such arguments, the MFA’s Cambareri acknowledged that the putti have many “Donatellesque” characteristics. She added that Butterfield has made a persuasive case, noting that the idea that both works were once part of an interior seemed plausible. While Butterfield eventually placed his sculpture on the market, Cambareri said the museum can afford to take its time. Cambareri added that she would like to see more scholarship, perhaps a joint exhibition of the two works, before she would be willing to upgrade the MFA’s attribution. In the meantime, the sculpture will stay in storage.